The Central Connecticut Swimming and Diving team capped off many hard battles with Northeast Conference teams by firmly defeating LIU Brooklyn on Saturday in their last home meet of the season. The Blue Devils won 14 out of the 16 events they competed in, garnering one or both the top two positions in every event. This victory, however, was not the only point of celebration on the day, as seniors Aidan Devers, Kaitlyn Troy and Valentina Gomez were honored for their efforts in the pool during their career at Central. It was a good day for the team to reminisce and celebrate the many commendable victories they had with the seniors and recognize how pivotal they were to being a cohesive and highly competitive force. With Devers and Troy, the Blue Devils were NEC Champions for two years and have been solidified as a force to be reckoned with during every season. “My freshman year and sophomore year, we won NECs. And then last year, we had a really hard season, and just finishing it out as strong as we did with all the hard hits we took was a proud moment,” Devers reminisced of her time on the team. The NEC women’s swimming and diving championship is the end of the season spectacle that rewards one of the teams with a championship title, and Central is no stranger to it. “That’s kind of where we’re at in our season we just want to get a little bit better, a little bit better. We had some pretty good swims today, things we can build on. We should be ready in a week and a half,” head swimming coach Bill Ball said. While hosting their last meet of the season and in preparation for the conference championships, the season looks like it’s going to wrap up soon for Central. As the team says goodbye to the seniors, Devers revealed what she will miss about them the most. At the meet on Saturday, Troy came in first in the 100-yard backstroke event and was part of the two relay teams, along with Gomez, that placed first in their respective events: the 400-yard medley relay with Gomez and the 200-yard freestyle relay. Devers came in second place to her teammate, junior Alexis Fredericks by two seconds in the 200-yard backstroke event. 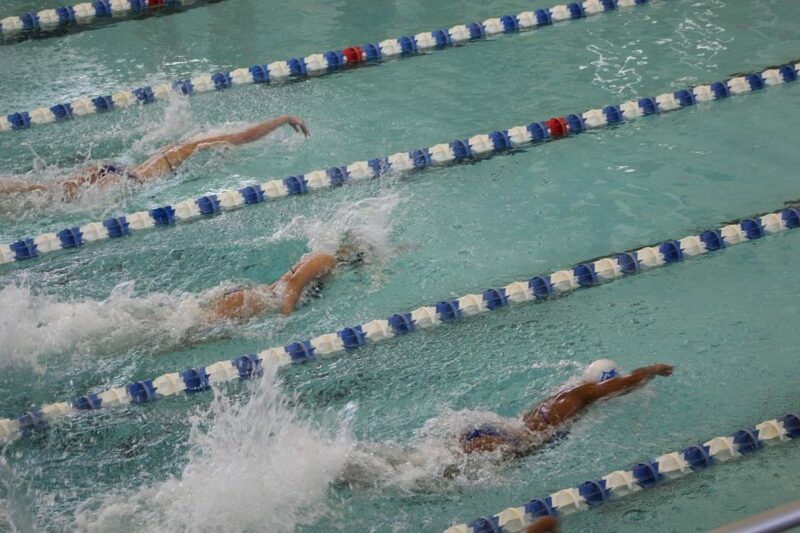 Gomez placed first in both the 100 and 200-yard butterfly events. “I still don’t even now think it’s hit me yet because I’ve been swimming here for the last four years. It hasn’t registered that I won’t be competing here anymore. It’s definitely a weird feeling,” Devers said. The team will look to put their best foot forward and look to improve and prosper continuing into future seasons. The team looks to stay strong and build off this success at the NEC Championships from Feb. 13 through 16.